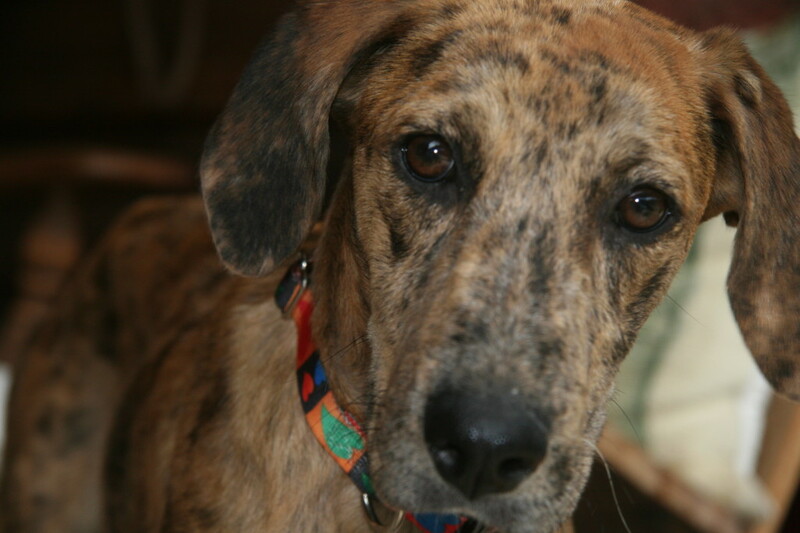 ← Catahoulas, Hummingbirds, & Bears Oh My! On Saturday night, we hosted a dinner party for two women we didn’t know with some other women we did know. How do you host a dinner party for women you don’t know? Let me tell you how we got ourselves into this. A couple of years ago we met a woman named Desiree’ who was a good friend of a new friend of ours at the time. Desiree’ recently flew through Dallas on her way home from Brazil and stayed with us for a couple of days. She introduced us to a woman named Diane who lives in Dallas who knew the two women we invited to dinner on Saturday. Diane knows about the Dusty Dog and called me a couple of weeks ago to tell me she has a friend named Emily who was coming to Taos for a couple of months to check it out as her possible retirement spot. She asked if we would introduce Emily to people – you know, help her network. I’m always up for a reason to host a party or a dinner or a simple get together, so I immediately called Emily, and we made a plan to have a dinner party for her and another friend who already lives in Taos, but who doesn’t know that many people either. Rhonda and I both love to spend the day in the kitchen cooking together, so we got out our cookbooks and the recipe binder and put together a menu dividing up who would make what things. I recently purchased Chocolate & Zucchini food blogger Clotilde Dusoulier’s new cookbook The French Market Cookbook and was excited to make something out of this new treasure. Since first reading about her curried leek tart tatin I have thought of little else. Who doesn’t like leeks and curry? And the combination of the two made my mouth water. And then add in a yogurt crust, which sounded healthier than my usual tart dough, and I was sold. We had a good laugh at their largeness and moved onto finding the other ingredients for our Saturday night feast for two women we didn’t know. Back at the Dusty Dog, Saturday came and a cooking fiesta began. Rhonda busily prepared her tamarind marinade for the gigantic fillet of salmon she chose and then moved onto making homemade vanilla ice cream and pulling together a salad. My only tasks were to make my special succotash that doesn’t involve lima beans, but I still call it a succotash (watch for this recipe in the coming weeks) and to make Clotilde’s curried leek tart tatin. Once I cut the white parts of the leeks into 3/4 inch long rounds, I had a moment of panic when I realized there was no way the white rounds were ever going to fill the center of a 10 inch round tart pan. They barely filled the center of a small loaf pan, which is what I ended up using. 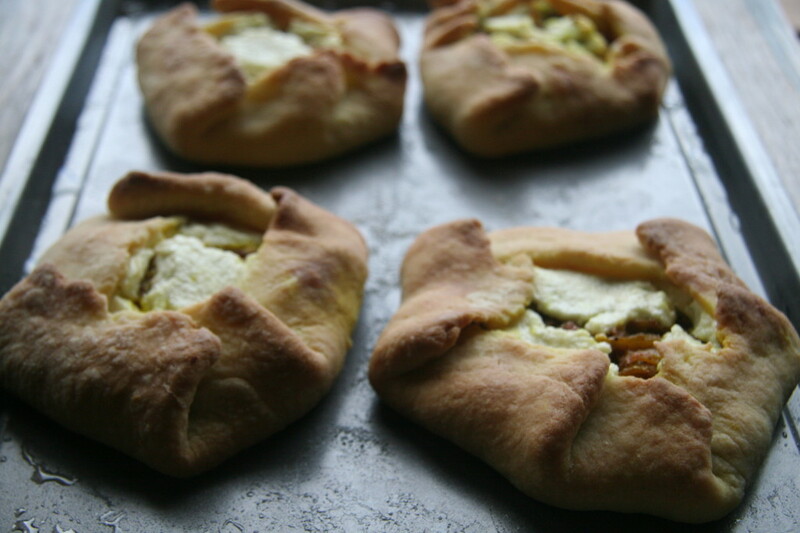 And there was no way the resulting tiny leek loaf tart was ever going to feed five friends and two strangers. Plus, I had a lot of yogurt tart dough left. In my hyper alert state, I looked around my kitchen and spotted onions. Onions are like leeks right? A light bulb lit above my head and that little voice inside my brain said, Why not use onions and make a galette to go along with the tiny leek loaf tart? Viola – a new variation of Clotilde’s curried leek tart tatin was invented – right then and there, just like that, on a normal Saturday afternoon in the Dusty Dog kitchen. I enhanced the curry with some turmeric root because turmeric is the new brain spice according to Dr. Andrew Weil, and we all want our brains to stay in top notch working order so lightbulbs continue to illuminate above our heads – right? Plus turmeric is good for other stuff too like preventing some cancers and helping with the inflammation of arthritis. 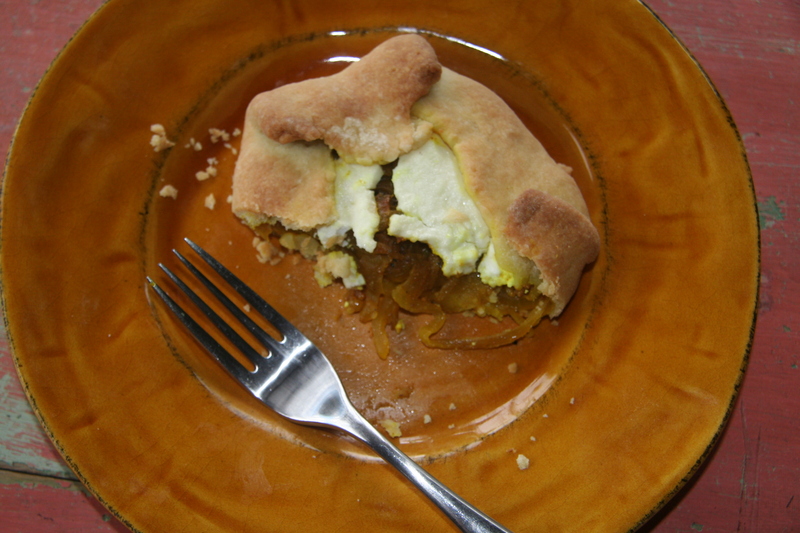 Both the tiny curried leek tart loaf and the curried onion and goat cheese galette were a huge success with our friends and the strangers, and the dinner party went off without a hitch. I’m not sure that two new friends were made on Saturday night, but everyone had some good laughs, a lot of great champagne, and delicious bold red wines to go along with the salmon, tart, galette, succotash, salad, and homemade ice cream. The next time someone asks me to help some strangers get to know new friends I will probably do what I did this time – cook up a storm, improvising along the way, and invite the strangers over to the Dusty Dog or wherever I happen to be when the request to help strangers comes up. 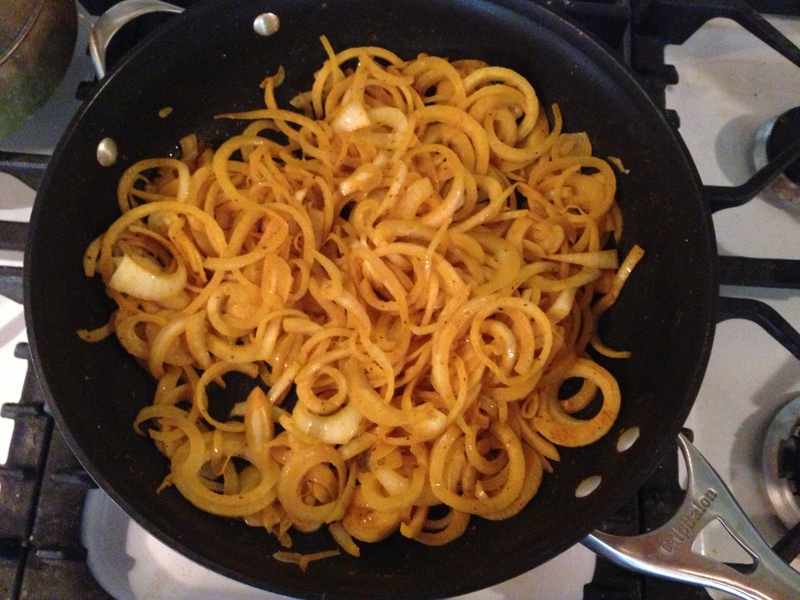 Heat the olive oil in a large skillet and add the onion rings once the oil is heated. Add the curry, turmeric, salt, and pepper. 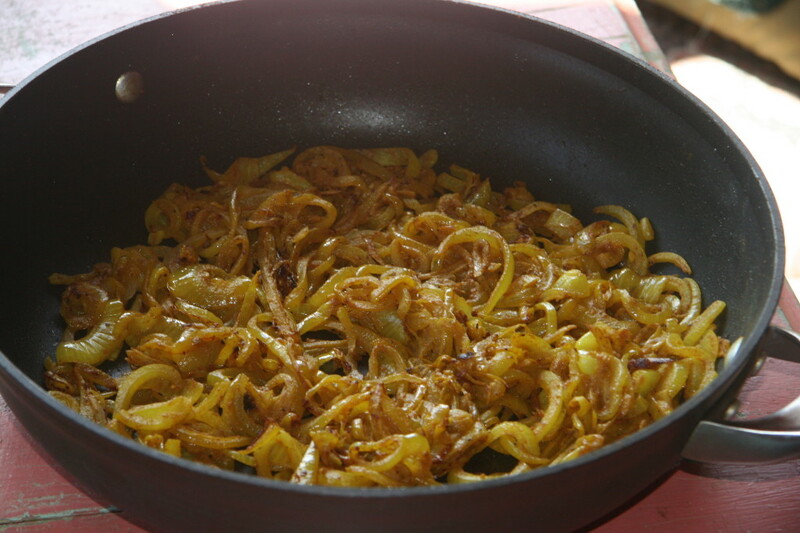 Saute the onions on medium heat, stirring frequently, until the onions are just beginning to get brown. Don’t overcook them – they can go from just brown to burnt very quickly. Allow to cool while you assemble the yogurt tart dough. This dough can be made in a food processor or a mixing bowl. I prefer using my food processor to mix pie and tart doughs because the food processor does all of the work for you. If you mix this by hand it will be a bit more of a process to bring it together with you having to kneed it more to get it into a workable dough ball. Place the flour in a mixing bowl and add the butter, salt, and yogurt. Use your fingers or a fork to rub all the ingredients together. When the flour and other ingredients are mixed together and there are no longer large clumps of butter place the flour on a floured work surface and knead together adding two to three teaspoons of water until a dough ball is formed. If you add too much water the dough may become too moist – if this happens add in a couple of pinches of flour and continue kneading until the dough is not too sticky but not too dry either. When the dough is the perfect dough-like consistency, separate it into four quarters and roll each individual quarter to about 1/4 inch thickness. 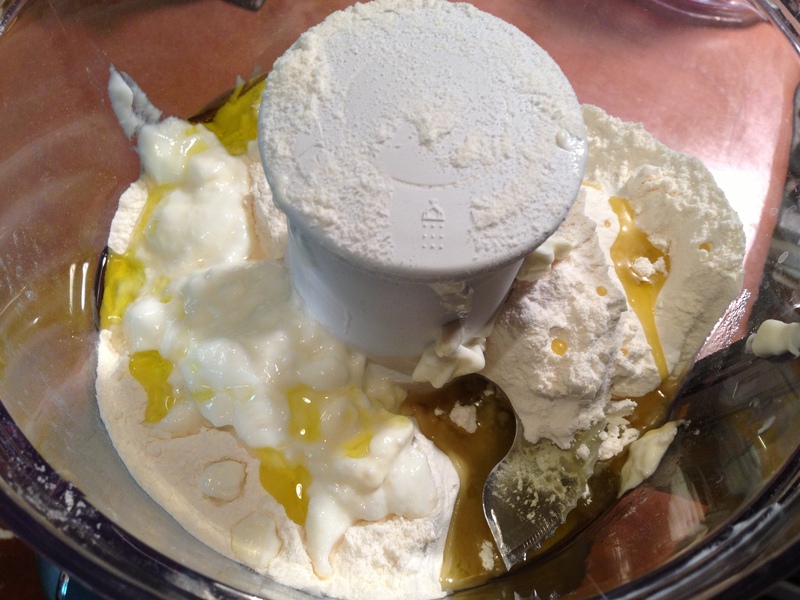 Place the flour, salt, oil (or butter) and yogurt into the bowl of your food processor. Mix the dough in quick pulses. After you have pulsed the dough and the flour mixture is incorporated, add two teaspoons of water. More water may be necessary if you used butter instead of oil. Continue mixing with short, quick pulses until a dough ball forms. 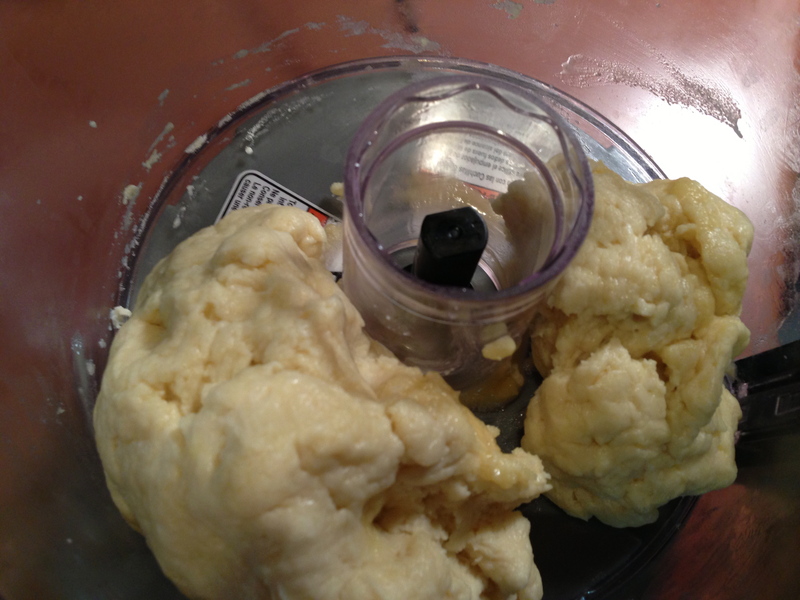 Once a dough ball has formed, remove the dough from the food processor. Working on a floured surface, knead the dough a little more to make sure it is the correct consistency to begin rolling. Remember you don’t want the dough to be too sticky or too stiff, but rather you want a nice workable consistency that can be easily rolled. 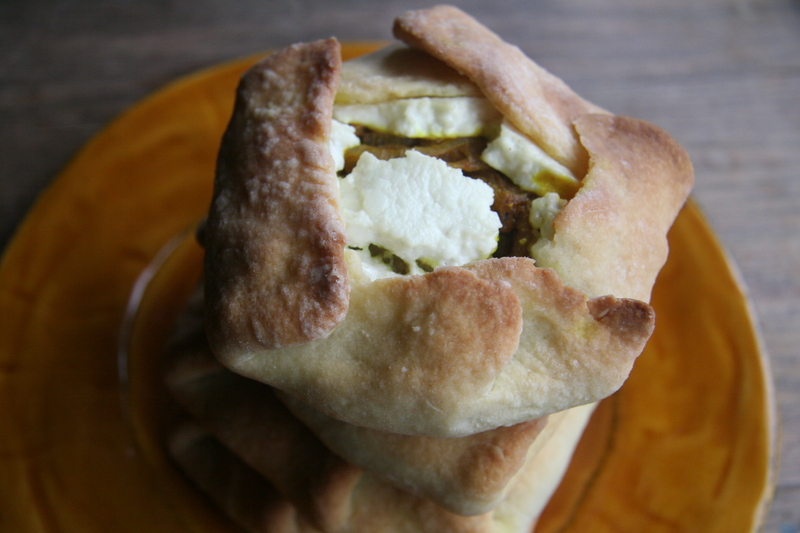 If you use olive oil, the dough will be moist but not sticky. When the dough is the perfect dough-like consistency, separate it into four quarters, and roll each individual quarter to about 1/4 inch thickness. Note: Clotilde recommends wrapping the dough in plastic wrap and refrigerating it for at least 30 minutes or as long as overnight before using it in your recipe. I didn’t do this because I failed to see that part of the instructions when I reviewed the recipe prior to making it. So, when I did make the dough, I didn’t have time to wait 30 minutes. My dough turned out perfectly despite not giving it time to rest. Preheat the oven to 350° and grease one cookie sheet using olive oil. 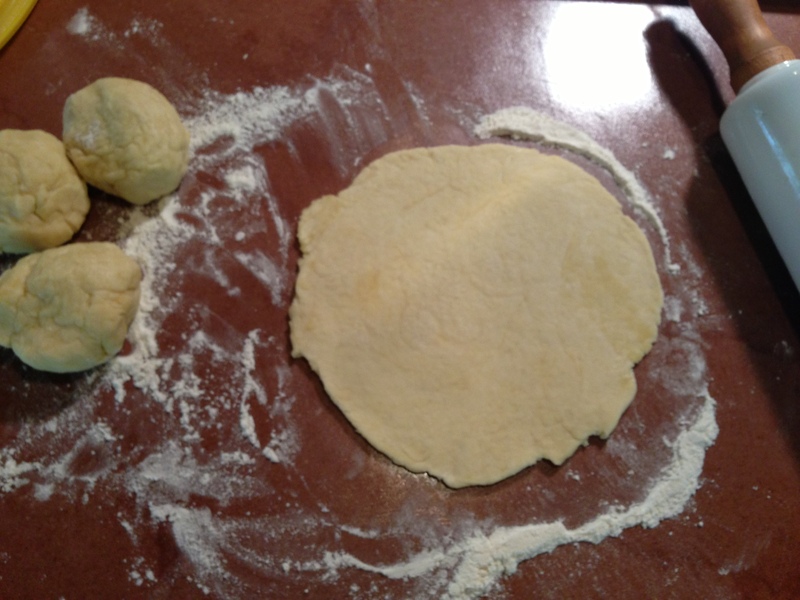 Working with one rolled out round at a time, place your rolled dough onto the cookie sheet and place one quarter of the onion mixture in the center of the dough round leaving approximately 1 inch around the edge. 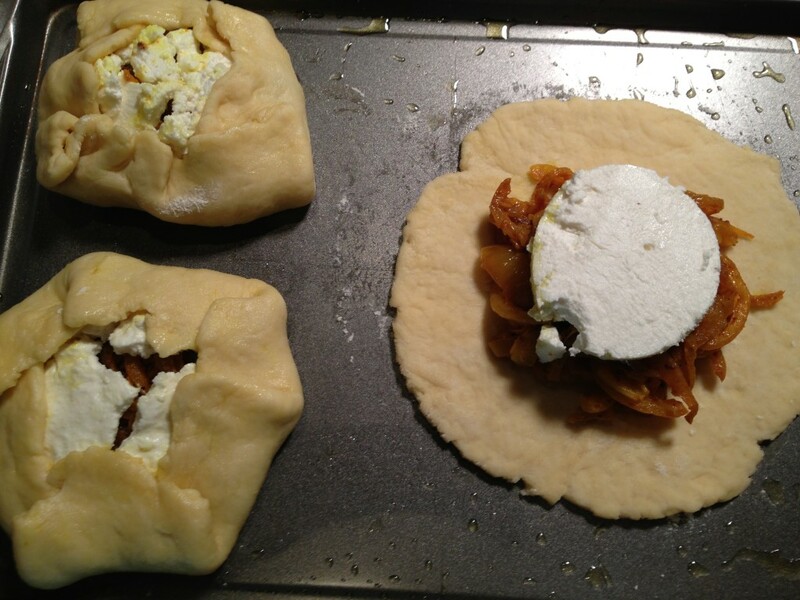 Place a slice of goat cheese on top of the onions. Gently fold the edges of the dough around the onions making pleats as you need to making sure all edges are folded in toward the center. Bake for 35 to 40 minutes or until the pastry is lightly browned. Serve hot out of the oven as an appetizer or as a light meal with a side salad or soup. These are just as delicious served at room temperature making them perfect for a picnic or a do ahead appetizer. Sweet Mabel got adopted by a loving family with two children and an old dog too. As of today, she is warming up to her new people and looking healthier than ever. 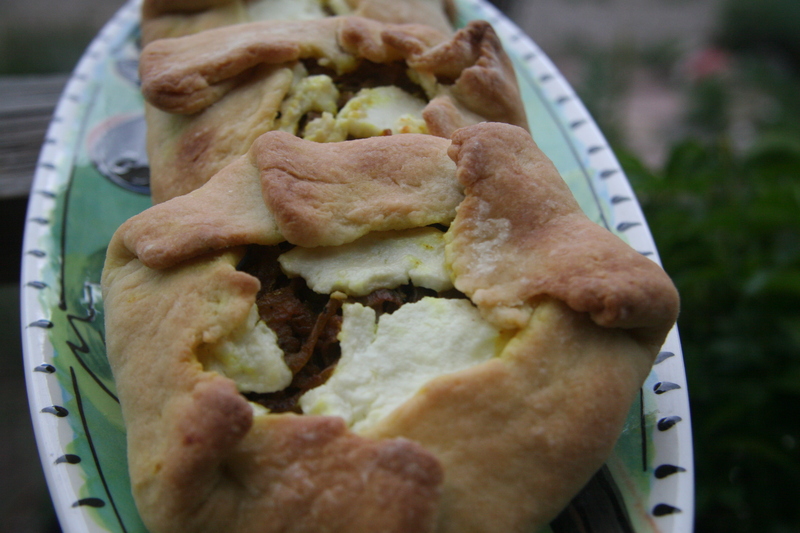 This entry was posted in Main Dishes, Miscellaneous, Recipes, Savory Pies, Sides, Uncategorized and tagged appetizers, Cheese, Curry, Entertaining, Galette, Goat Cheese, Onions, picnic, Sides, Vegetables, Vegetarian. Bookmark the permalink. I love onions in food. This recipe is a must for me to make. I am going to follow your excellent instructions. Thanks for the fun recipe! 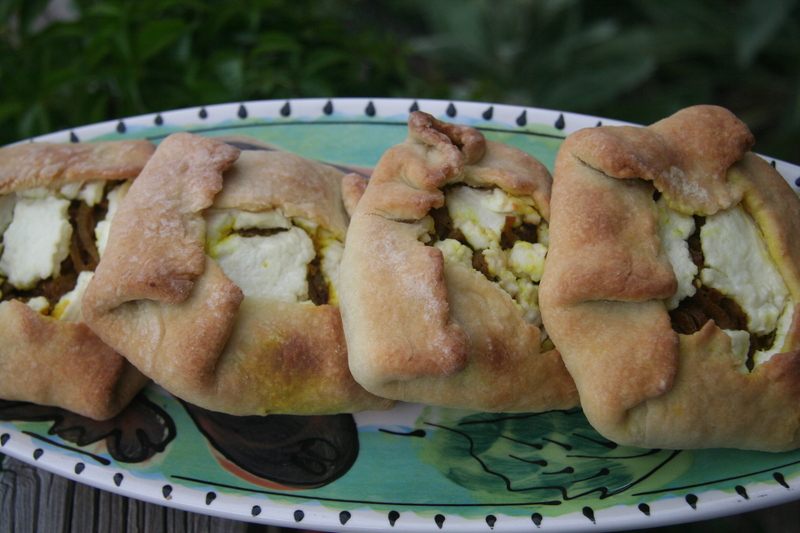 These are easy and delicious – enjoy!